Opiate drugs remain the most effective treatment for relieving pain symptoms of most any kind. Conditions involving back pain, post-surgery pain or just a plain old headache can all be treated using opiate drugs. Opiate derivatives span across multiple groupings within the opiate drug class, with opiate derivatives making up the majority of opiate drugs in general. Over the past decade, scores of new drugs enter the market each year, many of which are opiate derivatives. Opiate derivatives all come from the opium poppy plant in one way or another, with opium being the predecessor and/or template for all the drugs that follow. According to Palomar College, opium belongs to a class of drugs known as narcotic analgesics. In turn, most all opiate derivatives available today fall under the narcotic classification, which makes them highly addictive when not taken as prescribed. Understanding how opiates and opiate derivatives interact with the body’s system can help save you a lot of heartache in terms of avoiding the pitfalls associated with opiate abuse and addiction. 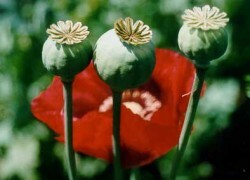 The opium poppy plant contains powerful pain-relieving properties. Opiate derivatives may or may not contain natural opiates as many are synthetically made in labs. That being so, synthetic formulations are still modeled after the natural agents. The human body houses its own pain management system made up of chemicals that share striking similarities with opiate alkaloids. These similarities account for why opiates do such a good job at relieving pain symptoms. Unfortunately, the therapeutic benefits derived from opiates can just as easily drive a person to drug abuse and addiction under the right circumstances. Any drug capable of interacting with the body’s own chemical system poses a risk, and opiates most definitely fit the bill. Opiates effects result from how these drugs interact with opioid cell sites. Opioid cell sites appear throughout the brain and central nervous system. In effect, most all opiate derivatives bind to these sites and trigger the release of endorphin chemicals, which play a central role in the body’s pain management system. Full agonist derivatives activate cell site chemical secretions. This group includes the majority of opiate derivative drugs, all of which are highly addictive. Partial agonist drugs play an important role in opiate addiction treatment, especially in cases of severe and long-term addiction. People recovering from severe addictions often experience ongoing drug cravings and withdrawal effects months after stopping drug use. Partial agonists provide considerable relief from these effects while at the same time blocking the effects of other opiates in the event of relapse. Opioid antagonist derivatives are also used in addiction treatment. Antagonists have one sole purpose: to block the effects of other opiates. These drugs block cell site receptors without triggering endorphin secretions. In this way, someone who tries to use will be unable to get “high” due to the drug’s blocking effects. Most semisynthetic compounds include a non-opiate ingredient, such as ibuprofen, aspirin or acetaminophen. These ingredients intensify the drug’s analgesic effects as well as the potential for abuse and addiction. According to the Institute for Substance Abuse Treatment Evaluation, opiate derivative effects work to slow chemical interactions within the brain and central nervous system, which ultimately slows all bodily processes. In terms of their analgesic properties, opiates’ ability to increase endorphin secretions has a slowing effect on nerve signal transmissions sent to the brain. When taken as prescribed, opiates pose little risk to normal brain and body functions. When abused, any one of the above major bodily systems can be affected in adverse ways.